Mapelastic Smart is used to protect concrete structures, renders with hairline cracks and cementitious surfaces in general which, being subject to vibrations, may suffer from cracking, and for waterproofing hydraulic projects such as channels, faces of dams and swimming pools, basins, storage tanks, balconies and terraces. Particularly suitable for waterproofing irregular surfaces. • Waterproofing hydraulic channels, faces of dams and basins. • Waterproofing bathrooms, showers, balconies, terraces, swimming pools etc. before laying ceramic tiles. • Waterproofing plasterboard, render or cementitious surfaces, lightweight cement blocks and marine-grade plywood. • Flexible protection layer of new concrete structures or repaired structures subject to minor deformation under load. • Protection of cementitious renders or concrete with cracks due to shrinkage, minor movement caused by thermal gradients or dynamic stresses due to the passage of vehicles, against infiltration of water and aggressive elements from the atmosphere. • Protection of concrete pillars and beams and road and railway viaducts repaired with products from the Mapegrout or Planitop ranges against the penetration of carbon dioxide. • Protection of structures with an inadequate layer of concrete over the reinforcement rods against the penetration of aggressive elements. • Protection of concrete surfaces which may come into contact with sea water, de-icing salts, such as sodium or calcium chloride, and sulphates. • High performance: a 2 mm thick film can cover cracks up to 2 mm wide. • Excellent mechanical characteristics thanks to the use of Mapetex Sel reinforcement. • CE-certified product in compliance with EN 1504-2 and EN 14891. • Excellent elongation at failure (120%). • Fluid consistency for easy application. • Resistant to UV rays. • May also be applied on existing coverings. • Compatible with ceramic, mosaic and natural stone coverings. 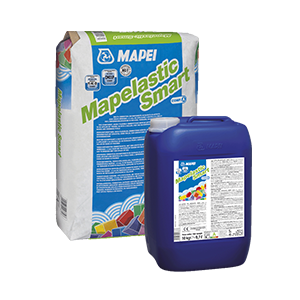 Mapelastic Smart is a two-component mortar based on cementitious binders, fine-grained selected aggregates, special admixtures and synthetic polymers in water dispersion, blended according to a formula developed in MAPEI’s own research laboratories. When the two components are mixed, a blend with a plastic consistency is obtained. It may be applied by brush, by roller or by spraying with a worm screw rendering machine on both horizontal and vertical surfaces at a thickness of approximately 2 mm. Due to the content and high quality of the synthetic resins, the hardened layer of Mapelastic Smart remains constantly flexible under all environmental conditions. Mapelastic Smart is waterproof and resistant to the penetration of aggressive substances which are present in the atmosphere, such as carbon dioxide, sulphur dioxide and sulphuric anhydride, and soluble salts such as chlorides and sulphates, which are present in seawater or in the ground. Mapelastic Smart has excellent bonding properties on all cementitious, ceramic and marble surfaces as long as they are sound and sufficiently clean. These properties, together with its resistance to the deteriorating effect of UV rays, a characteristic of this product, ensure that structures protected and waterproofed with Mapelastic Smart have a long service life, even if they are located in areas with particularly rigid climatic conditions, in coastal areas with a saline-rich atmosphere or in industrial areas where the air is particularly polluted. • Do not apply Mapelastic Smart at temperatures lower than +8°C. • Do not leave Mapelastic Smart exposed in swimming pools.